This morning I had the pleasure of the company of my good friend and fellow City guide Peter Twist on his early morning tour of Smithfield Market (an excellent walk and highly recommended, details of future dates here). The Queen’s Hotel was itself demolished in 1888 but there is a City of London blue plaque on the site recalling the location of the Bull & Mouth and the statuette referred to has been relocated to a wall outside the Museum of London. So, first part of the mystery solved; it was one of the many coaching inns that dotted London’s landscape until the 19th century arrival of the railways rendered them obsolete. Which only serves to open a deeper mystery: what on earth is it doing painted on the wall of the Smithfield underground car park? My first instinct when I saw it was “ghost sign”, but: i) The paintwork is far too fresh for that; ii) it’s about a half mile walk from the original site of the Bull & Mouth; and iii) the construction of the wall it is painted on was contemporary to that of the market in 1868 and therefore post-dates the demise of the Bull & Mouth by nearly 40 years (the underground car park at Smithfield was originally built as an underground rail terminus to deliver meat carcasses which were hauled up the curved ramp into the market). So, who decided to paint it there, why and when? I’m afraid I haven’t yet found the answer to that little conundrum, but hoping someone out there can enlighten us all. Well, this seems to have caused quite the stir! You’ll see from the replies below that the suggestion has been put that it was painted as a set dressing for a film (the area has been used as film location several times). This seems to me to make sense. For reasons outlined above, it could clearly never have served any practical purpose and it would have been a very strange place to put something merely intended as a piece of civic decoration. My esteemed Footprints of London colleague Brian McClory was one of the first to float this idea and has been delving into this line of enquiry. He has spoken to someone at the City of London Corporation film unit who seemed to recall stagecoaches being used for the filming of Dorian Gray there in 2009 and referred him to the location manager for the film. The location manager remembers the sign being there from when they were filming, but says it wasn’t part of their production, which was more centred on Smithfield’s Grand Avenue (which they had turned into a railway station for the day). He was emphatic that the sign was not put there by his art director for the simple reason it was already there and believes it was used for a film prior to theirs, but unfortunately couldn’t recall the name of the film. Previous Previous post: September is “Walks after Work” month! I suspect you’re probably right. It looks like it’s probably a reproduction of an advertising sign (“safe coaches”), looking into the possibility that it was painted up as a decoration when the area ceased being used to deliver meat and was converted to a car park, but still seems something of a random choice. I reckon must be a film set leftover ! Entirely possible! Someone else has identified “The Union” as one of the coaches that ran the route, they may have chosen this sign because of the use of the phrase “safe coaches” and this was MI6’s “safe house” in Skyfall (although not been able to find any reference to an original sign yet). Another guiding colleague is currently trying to contact the City of London film unit to see any of this can be verified. Researching my family history, I have just discovered from a census form that an ancestor, Richard Loughborough was a Police Constable, who lived here at number 13 at the time of the 1861 Census. He went on to be a beadle at Christs Hospital School. Further to my comment above, I have always lived around London, and I am always interested in its history. 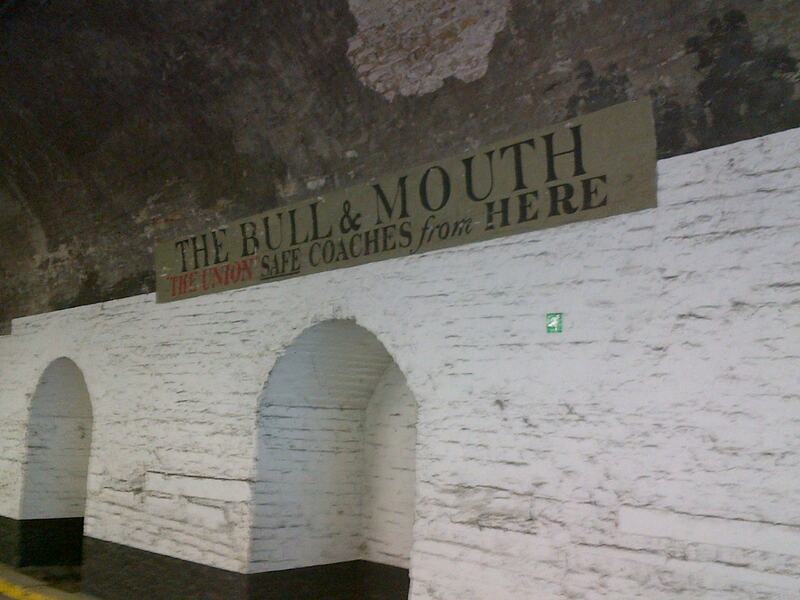 I was a bit skeptical about ‘Bull and Mouth’ being a corruption of ‘Boulogne Mouth’ for several reasons. Firstly, my interest is as follows. My ancestor, Richard Loughborough lived in 1861 at 13 Bull and Mouth Street (I have the census record). 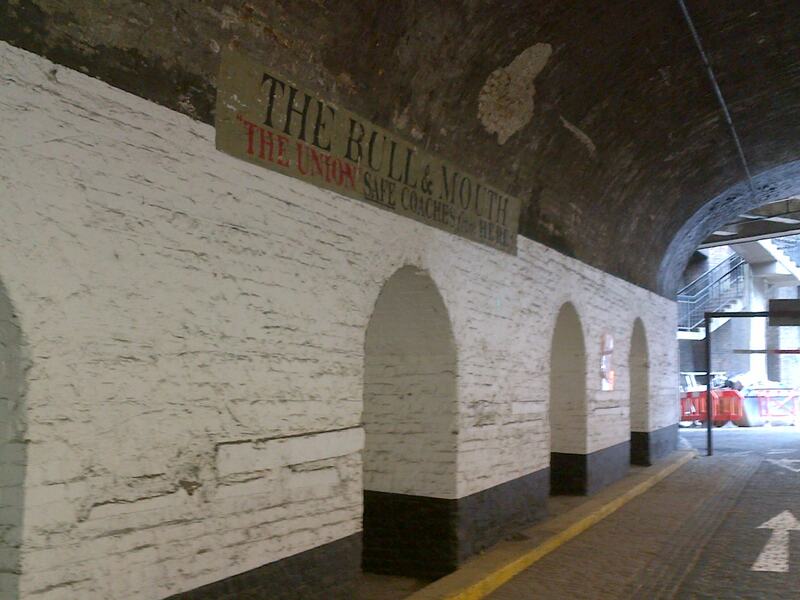 There are several pubs across the country called The Bull and Mouth, although I’ve never encountered one. Interestingly at the time Richard Loughborough was a policeman for the City of London police. 20 years later his job was Beadle for Christ’s Hospital School in the City, credited as being the country’s oldest boarding school. Originally in the City, it moved to Horsham in Sussex about 1902, and Horsham, Victoria, Australia has a pub called The Bull and Mouth. Odd coincidence…. The image of a bull, with a nose ring, is very common in the UK, often seen on doors where it is used as a door-knocker, and calling a pub with such an adornment the ‘Bull and Mouth’ seems much more likely. I am dubious that a minor victory, even over the French would lead to pubs commemorating it in Leeds, Liverpool, Sheffield, Holborn, Regent’s Circus and the City. Many pubs didn’t even have real names in 1550, travel was limited, as was education. I do tend to believe that an unwanted explanation has been derived for a problem that doesn’t exist. I do accept that it is not unknown for returning military to start a business using severance pay, often using the name of a leader or battle. ) Marquess of Granby, for example.) I wonder what story will be doing the rounds in 2117, explaining the Goat and Tricycle in Bournemouth! Ah, well, back to my Loughborough family research. While doing research on my family i found a document stating the Bull & Mouth as their wedding location in 1735. My ancestor, Michael Scaysbrook, was sentenced to be hanged (later commuted to a life sentence to the colony of NSW) for committing a robbery on 24 November 1814, against Mr John Willan, who ‘kept” ‘the Bull and Mouth, in Bull and Mouth Street…in this house there are many apartments, in which many of Mr Willan’s servants reside….there are two outward gates one which the coaches go in and the other the wagon horses; that is the upper gate…” (proceedings of his trial at the Old Bailey 11January 1815). Michael’s defence was that he was ‘in distress’ and had previously worked for Mr Willan.